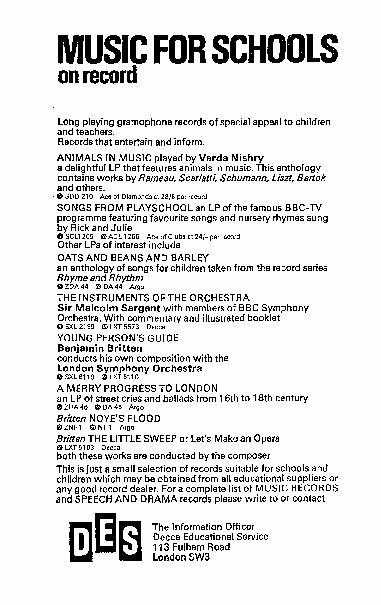 All tracks taken from Rhyme and Rhythm, an anthology of poetry and music for the primary school recorded in association with Macmillan & Co Ltd.
"This collection of songs loses some of the original impact when they were spatchcocked between readings, but simply as ‘a jolly record for children’ it should find favour. "The performances could hardly be bettered, and apart from many nursery favourites some of this will be new to most readers, such as the hilarious I had a Hippopotamus, which is worthy to stand beside the Flanders-Swann classic. "Anybody who hesitates at the prospect of having to listen to all the verses of The Derby Ram need not be worried. There is no dawdling, and most children will be asking for more. The answer is easy. Buy the original set; you will never regret it." ~ by folkcatalogue on September 23, 2009. We had these records for our children when they were young, and they were firm fsvourites. Do you know where I can get a copy of the songs and poems? Hi. They’re long out of print, but copies of the records and books occasionally come up on ebay. Once I’ve got round to digitising the ones I’ve got, I’ll be happy to share them with you. Were you in new zealand when you got them for your kids? 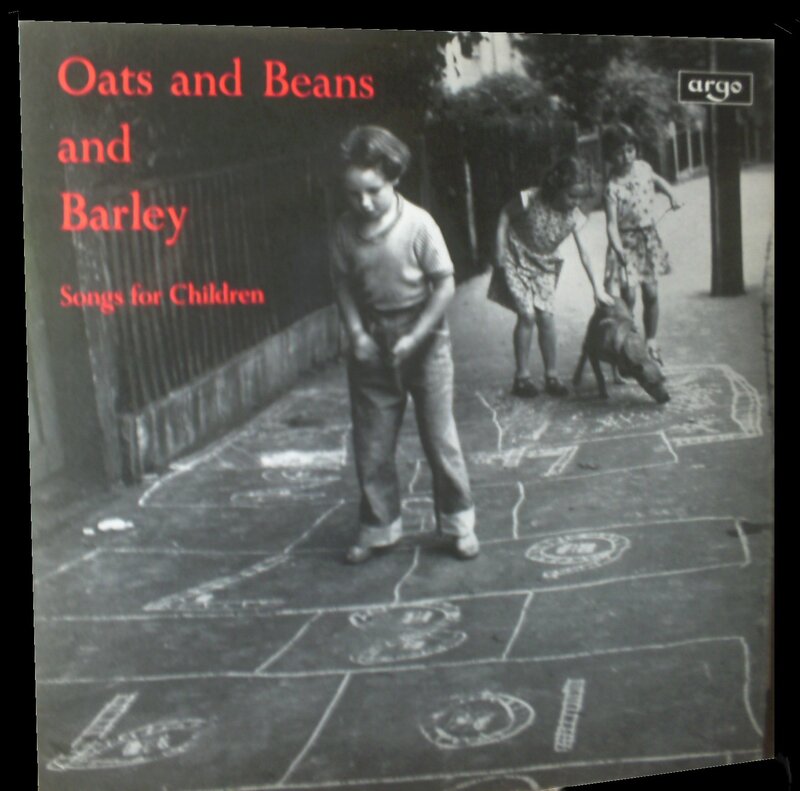 Hi, as with the above poster I had Oats and Beans and Barley on tape as a young child – probably a hand-me-down from my mum – and loved it. Sadly, the tape is now lost and I’d love to find a digitised version. I loved Benbow and Bruton Town in particular – not sure if that implies I was a particularly bloodthirsty child?! If you have any info on where to look for a CD or mp3 I’d really appreciate it. Thanks for providing the information about these records. Its really interesting. I don’t have these records but I have a cassette called The World Of The Very Young which was released in 1972 and has some of the songs off of these records. Have you heard of this album before? Also, do you know where I can find the song A Frog He Would A Wooing go(the one that appears on this page)? I’m really enjoying that one. cheers for the kind offer. yes, i’ve got the track listing of the ‘world of the very young’ lp. just haven’t got round to doing an entry for it! will send you an email to see about getting the Frog song to you. Oh, I would be so excited to be able to hear this tape again. From “Old Daddy Fox” to “Fire in the Alley” to “Pop bottles pop bottles in pop shops,” this was such an important part of my childhood. If a digital version exists, I cannot tell you how thrilled I would be to hear it again! Thanks for your comment and for your email regarding the Frog Song. Interesting to hear you’ve got the tracklisting for the World Of The Very Young. Do you mind me asking, was this album actually released on vinyl LP? I’ve been trying to find out for ages whether or not it was but there doesn’t seem to be any mention of it anywhere on the internet. On a similar note, do you know if any of the albums featured on this page were made available on cassette as well as vinyl? you’ve spurred me on and i’m posting details about the vinyl version later on tonight. not looked into the cassettes much yet. there was lots of argo classical and spoken word on cassette in the 70s and 80s, but haven’t come across any of the kids’ ones, apart from the one you’ve got. I’m looking forward to hearing more info about the LP version. It’ll be interesting to see if the tracklisting is different to the cassette. I do wonder if the order was different because unlike most cassettes, this one has two continuous sides of music with no gap at the end. I’d be quite interested to hear more about some of the later cassette releases you mentioned. Am quite suprised that you’ve not come across any earlier ones. decca (who owned argo) were very late getting in to cassette technology. they were a bit sniffy about the quality till dolby b arrived. the label issued its first cassettes in october 1970, so this argo compilation ‘re-issue’ was among the earlier ones. Hi. This was my favorite record as a child (born 1972) – I’m still singing these songs, and (in fact) so is my Dad. I’m looking for a copy for my two boys. Please, has someone got one? I’d pay good money for a CD version.